NPUK > Get Involved > Where Does Your Money Go? NPUK is driven by our objectives and the needs of the patients and families we support. We would not be able to meet those needs and expectations without the amazing fundraising efforts, donations and tireless activities of our members, families and friends plus the grant funding we receive from BBC Children in Need, The Big Lottery Fund, The Hollie Foundation and many others, acknowledged here. Please read the following summary of our financial review in conjunction with the approved Report and Financial Statements for the year ended 30 April 2017, which are available to view here. We recognise the tremendous effort that goes into organising fund raising events and, at a time of continuing economic uncertainty, we are extremely grateful to all those who support of our work. We restrict donations for the purpose specified and confirm that all general donations and money raised by our community during the financial year, 2016/2017, was allocated as specified, either to our Care and Support or Research Service. The following charts show the source of funds received and expended, and how we use them to meet our aims and objectives. They also demonstrate the continuing need and importance, of your support and that of our grant providers, which is vital to the continuation of our support services. Our total income for this financial year was £244,025, of which we received 32% in grants from the Big Lottery Fund, BBC Children in Need and the Hollie Foundation. At a time of continuing financial uncertainty, we are fortunate to have the amazing support of our members, families and friends who, through fundraising events and voluntary donations, contributed a combined 31% of our income. We are truly grateful for this support. Investment income (3%) and gift aid (1%) were small, by comparison, and over the coming year we will review investment opportunities to ensure the best return on our investments and further encourage donors to make a Gift Aid declaration in order to maximise donations. Expenditure for the year amounted to £358,400. This was £114,375 more than the income received and reflected the opportunity to reduce our reserves by converting the balance of an unrestricted legacy (£154,560 in 2016) into care and support for patients and families. 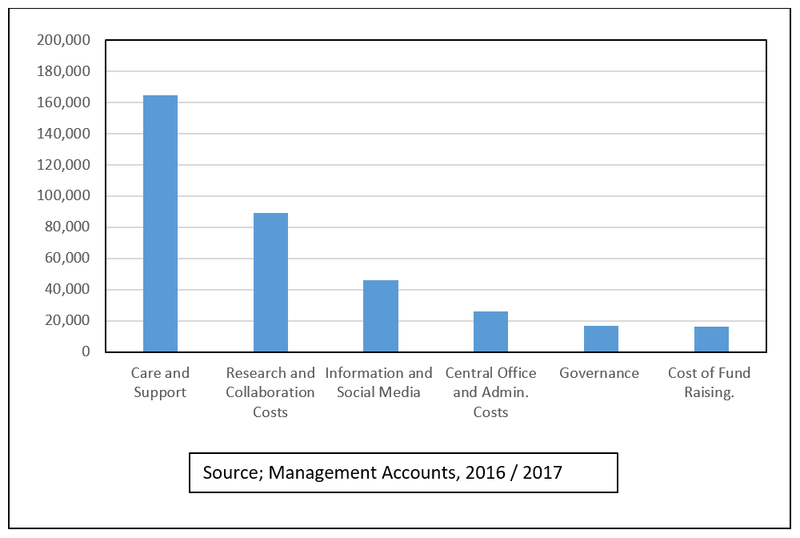 In 2016/2017, 46% of our expenditure was attributed to our Care and Support service, followed by 25% Research and Collaboration and 13% Information and Social Media. – Research and collaboration reflects small grants to academic institutions for specific research projects, our collaborative work with the Department of Health, NHS England and the LSD Expert Advisory Group, pharmaceutical companies, research organisations and relevant patient groups to influence the future of care and treatment, clinical trial design and access to therapies plus national policy on welfare and NHS reform. – Information and Social Media (13%) captures the costs of providing information through all channels including our website, social media platforms, newsletters and information leaflets. 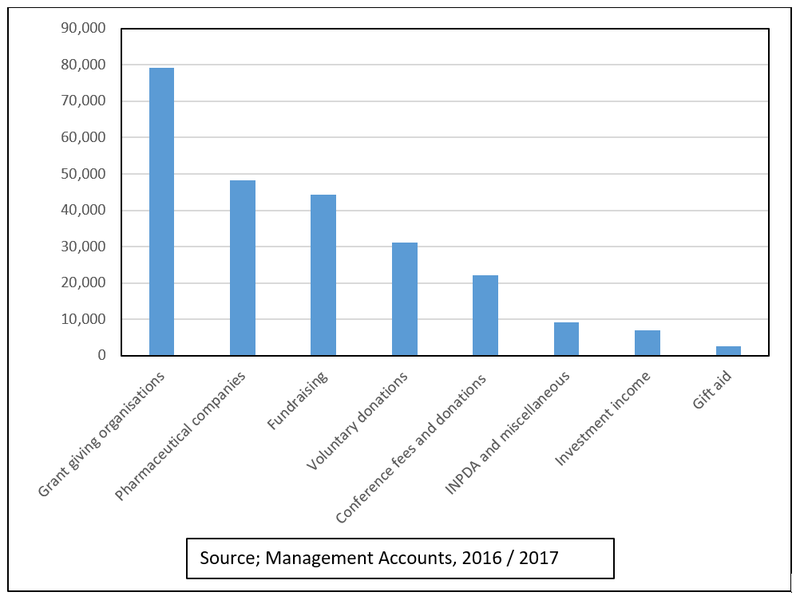 – Central Office and Administration Costs (7%) reflect the expenditure associated with running the Central Office and meeting our statutory obligations, they include rent, overheads and the role of our Finance and Administration Officer. We are fortunate to share the roles of the Social Media and Communications Officer and the Finance and Administration Officer with the International Niemann-Pick Disease Alliance (INPDA – www.inpda.org). This has the effect of sharing associated costs and reducing the cost of overheads and administration for NPUK. Please refer to the Report and Financial Statements for the year ended 30 April 2017 for additional information about the financial accounts, reserves policy and endowment fund. If you have any questions or would like to discuss any aspect of this report, please contact our Central Office by telephone 0191 415 0693 or by email info@npuk.org.